"The Hifidelio is a music server to be connected to your stereo system and is designed to store your complete music library and play it back. It enables you to very easily find the music tracks you want to play. You can store songs from external sources on your Hifidelio, and you are able to produce your own CD from its content (obeying the Copyright Laws of your country). You can generate individual playlists or let the Hifidelio generate searchlists according to criteria you have defined. 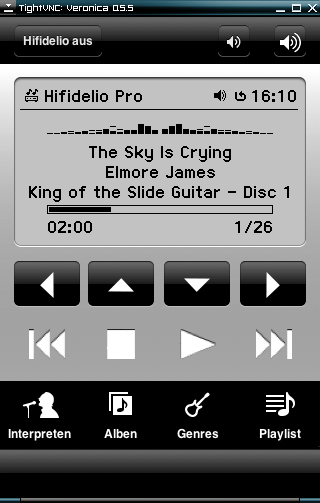 You can connect the Hifidelio to a computer network and broadcast per streaming Internet radio stations. Additionally, you can create a multi-room solution by connecting the Hifidelio to other additional devices, the so-called satellites. Your Hifidelio can then distribute its music to these devices based in various rooms. You can also use the Hifidelio as a simple CD player." 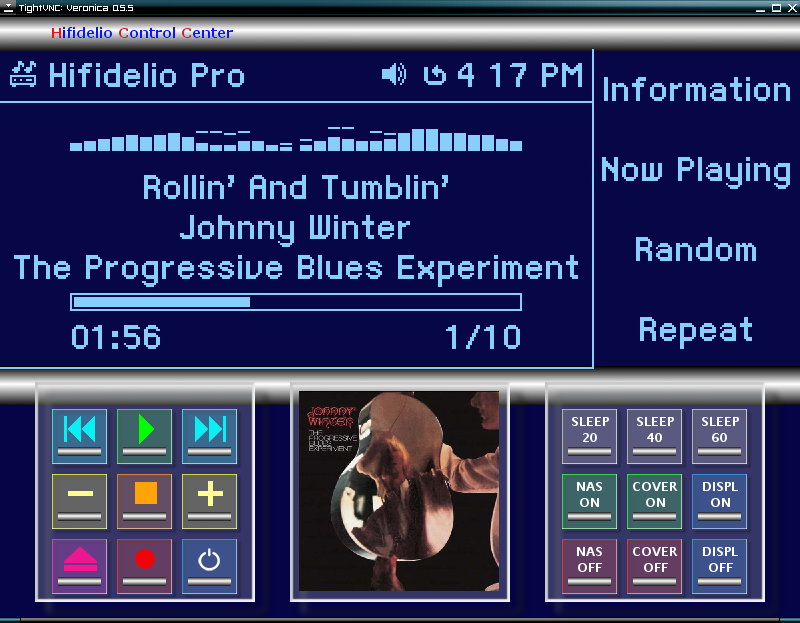 Veronica is a VNC server that allows remote control of a Hifidelio Wireless Music Center using your network connection. This technology allows the creation of a virtual screen on server side that the user is able to control on client side. Veronica uses the LibVncServer library (distributed under GNU public license) which implements the underlying Remote Framebuffer Protocol. On client side, you need a VNC viewer application that can display a virtual VNC screen. You easily can find online and download freeware VNC client applications for popular personal computer operating systems (including Windows, Mac OS X, and Linux,) PDAs and mobile phones. These commands are equivalent. Both create a file named "hfshot.jpg" in the directory "/audio/import" with a JPEG quality of 80. The foreground and background colors are defined using a hexadecimal notation for the combination of red, green, and blue color values (as done in HTML documents). hdreset resets the hard disk checksum in EEPROM Atmel 24C08 of newer Hifidelio devices. This tool is required if you must replace the internal hard disk due to failure or for some other reason. Vincent Kars' "Rough Guide to the Hifidelio"